How Much Does it Cost To Resurface a Tennis Court in Seattle and Tacoma? It normally costs somewhere between $4000 to $8000 to repair and resurface a tennis court in Seattle, Tacoma, and Western Washington. Depending on the severity of asphalt or concrete cracks, low spots or puddles, and cleaning required, this cost range should fit for most situations. If you would like a free quote from an experienced sport surfacing contractor, fill out the form on this page and we will help to set up your free consultation. SportMaster has 16 standard tennis court colors to choose from, and you can try many combinations by checking out the SportMaster court designer. This tool allows you to select your inside and outside court colors and see how that compliment each other. From popular combinations like blue and light green, to traditional red and green, SportMaster has more standard colors than any other brand. Check out ColorPlus Orange for a brighter and cooler surface! 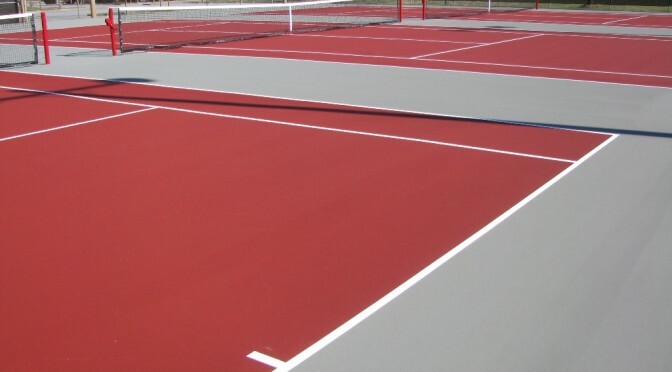 Our tennis court builders and resurfacing contractors are well trained in building and surfacing Pickleball courts. Pickleball is one of the fastest growing sports and is extremely popular in Seattle and Tacoma WA. Pickleball courts require much less space than tennis courts, but are built and surfaced with the same materials as tennis courts. We look forward to hearing from you and answering any of your questions. Fill out the contact form on this page and we will get back with you very soon.